Desmond Choo, 34, has again been chosen by the People's Action Party (PAP) to stand as its candidate in the upcoming by-election in Hougang. 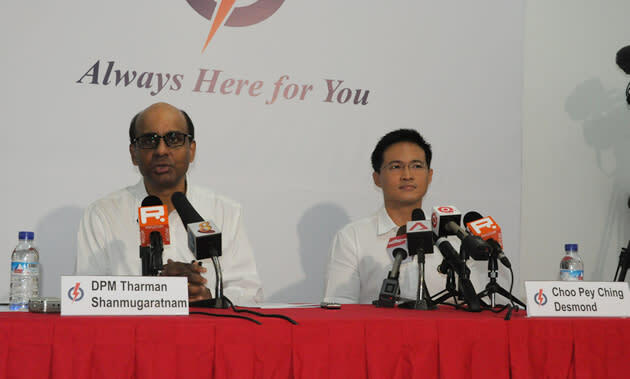 In a press conference on Thursday morning, PAP Second Assistant Secretary-General Tharman Shanmugaratnam announced Choo's candidacy. The unionist was introduced as “someone you can trust, someone who genuinely cares about people, and someone who’ll always be there for his constituency”. The PAP is “proud” to field Choo again in this by-election, the Deputy Prime Minister and Minister for Finance and Manpower added. Choo, grassroots adviser for the single-seat ward, said he feels honored to represent supporters and residents in the by-election, which will see residents trooping to the polls on 26 May. He will be up against Workers’ Party's Png Eng Huat. Despite the setback in the May general election last year when he lost to then WP member Yaw Shin Leong, Choo said he has never stopped working the ground and has since introduced various social assistance initiatives to benefit residents. Besides a focus on caring for the needy elderly and low-income residents, the PAP candidate also announced the opening of a legal clinic, in partnership with the Association of Criminal Lawyers of Singapore, to cater to the needs of the many residents seeking legal advice. The monthly legal consultations, which will start on 15 May, will be free of charge. “My approach has always been to do more than what the Government does. I will mobilise support and resources and take real, concrete actions to help residents tackle their problems,” Choo pledged. He acknowledged, however, that he will face a tough contest in the single member constituency (SMC), which has been a stronghold of the WP. “But our spirit is strong and we will fight to convince voters that we are the better choice for their long term future,” he added. The deputy director of the National Trades Union Congress' (NTUC) Industrial Relations Unit had been widely expected to be PAP's candidate in a Hougang by-election, which had been prompted by the fall from grace of Yaw. Yaw was expelled from WP on 14 February following allegations that he had extra-marital affairs, including one with a married female opposition party member. The Hougang seat was then deemed vacant. "'Yaw saga' a closed chapter"
When asked if the PAP plans to use WP’s recent trouble to their advantage in their campaign strategy, Choo said that the Yaw fiasco, while unfortunate that it happened, will not distract him from his initial plan. In last year's GE, Choo lost to Yaw after garnering just 35.2 per cent (8,065 votes) of the votes, the lowest share of votes by a PAP candidate in the constituency. The WP, led by Low Thia Khiang, has reigned in the Hougang ward since 1991. Contrary to speculation, Choo also revealed that he plans on working “alone” instead of roping in PAP heavyweights. “I’ve been on the ground, I’ve served, I’ve tackled residents’ issues… This is very much my own fight,” Choo said. 34-year old Choo has long been a member of Singapore’s labour movement. In his current post at NTUC, he deals with issues related to wages, community engagement and labour market monitoring. He is also concurrently the executive secretary of the Union of Security Employees and of the Singapore Shell Employees Union. Prior to NTUC, he had served in various roles in the Singapore Police Force and Ministry of Manpower. Choo was the deputy commander at Clementi Police Division from 2009 to 2010. Before his appointment as the Second Adviser to Hougang Grassroots Organisations in February 2011, he had worked extensively in the Marsiling and Tampines East constituencies. In Hougang, he has initiated a healthcare scheme to benefit poor residents, and coffee sessions for residents to be directly involved in building their community. Choo studied in Ai Tong Primary School, Catholic High School and National Junior College. He was awarded the SPF Overseas Merit Scholarship in 1997 to study Economics at the University of Chicago. He is married to Pamela Lee. This article is published by Yahoo! Asia Pacific Pte. Ltd., 60 Anson Road #13-01 Mapletree Anson, Singapore 079914.